Phone: +1 604 875 4122. Fax: +1 604 875 4695. In chronic obstructive pulmonary disease (COPD), patient education is one of the fundamental components of successful self-management. However in most instances patient education is limited to the transfer of information about COPD, its causes and its treatment. Moreover, among patients who have received health information regarding their disease, a number do not continue disease management at home or outside of the healthcare setting. This is in part due to misunderstanding instructions given by care providers. Additional issues arise when patients and care providers do not share a common language. Developing information materials in English and then simply translating them into either written or video formats is not effective because the materials do not incorporate patients’ cultural beliefs, views or perceptions. This study investigated howpatients with COPD, from new immigrant communities in British Columbia, Canada, received and utilised information about their condition and its management as a basis for developing appropriate educational materials. We applied a community-based participatory approach in learning about the cultural beliefs and perspectives influencing patients’ selfmanagement practice. Family members and home caregivers were also encouraged to become involved in the material development and learning process. Qualitative focus groups and individual interviewswere conducted with a total of 46 COPD patients (n=30) and their family members (n=16) from Chinese (Mandarin andCantonese), Filipino,Korean, English, and Farsi ethnic minority communities in the Greater Vancouver Area between May 2013 and March 2014. Findings were summarised into five themes: current knowledge and practices of COPD selfmanagement; trusted sources of health information; insufficient care received from doctors; information they wish to receive; barriers to accessing health information. Data analysis of these themes showed that it is essential to consider diverse cultural beliefs and practices when developing selfmanagement educational materials for patients from ethno-cultural communities. Our findings suggest that engaging patients in all stages of development may increase patient efficacy and motivation to apply and use information, as well as ensuring that materials developed are relevant andappropriate for minority groups. Chronic obstructive pulmonary disease (COPD) is a disease of the respiratory system defined as irreversible airflow obstruction. It is the third mostcommon cause of death in the world (Lozano et al, 2012; Kim and Criner, 2013). It is one of the leading causes of death worldwide and is one of the few chronic diseaseswhere mortality and hospitalisation rates are increasing (Ernst et al, 2000; Chapman et al, 2003; Buist et al, 2008). Education, self-management, and access to appropriate medications are essential in preventing complications and in improvements in quality of life. Access to plain language health information materials has been shown to play an important role in improving patients COPD knowledge and self-efficacy to manage their illness (Scott et al, 2010). Members of minority ethnic groups may not have the same level of access to health information as patients from mainstream communities if they do not speak or read the country’s official language. In Canada, health information resources reach only a small proportion of minority ethnic communities as many information materials are developed only in either English or French (the country’s two official languages). Smoking is very common among members of these groups and there is a high incidence of COPD (Chapman et al, 2003; Evans et al, 2010). Language or literacy limitations and cultural issues may influence these patients’ awareness of COPD and how to control and self-manage it (Oxman-Martinez and Hanley, 2005). Translated materials are not necessarily effective as they may not present health information in culturally appropriate formats (Caidi, 2008). Even when they are able to access care, patients who are members of minority ethnic groups may not adhere to treatment regimens and may have limited understanding of their condition due to language limitations and cultural issues (George et al, 2007; Karliner et al, 2007; Restrepo et al, 2008). Family involvement is another crucial factor in the selfmanagement of COPD in many ethno-cultural communities (Holm et al, 2009). About 30% of people living with a chronic condition rely on a family member for use of medication and care at home. Thus it is important to involve home caregivers when planning educationalmaterials about self-management (Kanervisto et al, 2007; Rosland, 2009; Poureslami et al, 2012). Little work has been done in Canada to examine the impact of health information materials about COPD for patients who are members of minority ethnic groups (Monninkhof et al, 2003; Coulter and Ellins, 2006). To the best of our knowledge, there is no published article in the literature reporting a study that has developed COPD educational materials at an appropriate health literacy level, considered culture-related issues, or engaged patients and family caregivers in the development of such information materials in Canada. Ethnic minority patients are more likely than members of other groups to have poorly controlled COPD (FitzGerald et al, 2007; Ng et al, 2012). This project sought to address the needs of members of minority ethnic groups by developing appropriate educational materials about COPD. The objectives were to: (i) assess knowledge, attitudes, and beliefs related toCOPDselfmanagement practices within the target communities; (ii) investigate access and utilisation patterns of COPDrelated information and care services among participant groups; (iii) examine the feasibility of involving family caregivers in the learning process and selfmanagement practices. We aimed to identify the link between culture, beliefs and COPD self-management in order to help us to develop culturally and linguistically appropriate patient educational materials. A community-based participatory approach (CBPR) was used to collect qualitative data from COPD patients in Chinese (Mandarin and Cantonese), Filipino, Korean, English and Farsi communities living in the Greater Vancouver Area (GVA) (Lantz et al, 2005; Horowitz et al, 2009; Poureslami et al, 2011, 2014). CBPR facilitates partnership among key-stakeholders such as community members and key-informants, professionals and researchers throughout the entire research process, as well as the representation of social and cultural dynamics of the community and application of knowledge gained to improve the health and wellbeing of community members (Kidd and Byram, 1979; Krishnaswamy, 2004; Murphy et al, 2007; Poureslami et al, 2012). In our study, CBPR enabled us to involve patients, family caregivers and professionals in all aspects of the design and implementation of the project. Focus group and interview questions were developed with direct involvement of community key-informants and professionals working with the target communities. Patients were also asked to provide feedback and their thoughts on the drafts of the educational materials during focus group sessions and individual interviews. A network was built and the research team established trusting relationships with community organisations, key-informants and professionals in the GVA. Initial drafts of the educational materials were developed by COPD health professionals, as explained below, prior to the focus groups and interviews. To ensure that we developed materials which could help our targeted COPD patients learn more about selfmanagement practices, we conducted a number of patient-oriented focus group sessions and individual interviews to check the understandability, relevance and cultural acceptability of our materials. Data collection was undertaken through five focus group sessions (37 participants in total with six to nine in each session) and nine individual interviews, covering a total of 30 patients and 16 family members. Individual interviews were conducted with participants who were unable to join the group discussions due to time, location or severity of their disease (e.g. needing to use an oxygen tank) but still showed interest in contributing to the study. Each participant was only required to attend one focus group or interview. During the sessions we encouraged participation and involvement of family members in the discussions. Patients were asked questions on how they normally obtain and acquire health information related to their COPD, their views and comments on initial drafts of the educational materials, barriers to accessing health information, concerns about COPD self-management, and how cultural beliefs and perceptions relate to their disease management. Identical questions were used for both focus group discussions and individual interviews. As our main goal was to create educational materials which could be helpful in aiding COPD patients from the target communities better manage their disease at home, no demographic information was collected. Focus group sessions lasted roughly 90 minutes; the interviews were roughly an hour. Initial materials included: proper use of their medication (inhalers), steps to manage exacerbations (lung attacks) at home, and light exercises and breathing techniques that could be easily done at home. The English written print materials were developed by the COPD Best Practice & Evaluation Working Group at Vancouver Coastal Health, which we sought as a professional consultant group, with input and involvement of healthcare providers working in the community. The materials were then translated into the target languages by community facilitators, which were further reviewed by the study team, health professionals and community key-informants for accuracy and scientific soundness before being reviewed by COPD patients in the focus group sessions and individual interviews. A graphic artist drew pictures for each step of inhaler use, showing pictures that featured ethnic-specific community faces, different genders and elderly people. Patients and their family caregivers were asked to advise on the format of educational materials (videos and pamphlets) and the information they wished to receive. Further content of the inhaler videos and pamphlets was reviewed and developed through direct involvement of patients, family caregivers, community key-informants and health practitioners to ensure cultural and linguistic acceptability. The instructional knowledge videos were derived from pictorial pamphlets using the same informational content in a different presentation format. After the materials were developed, we pilot-tested the videos and pamphlets with selected COPD patients and their family members from the target communities. During the pilot testing, participants were asked to review and comment on the materials and help us to improve them in terms of readability, accuracy, understandability and relevance to their cultural beliefs and practices. Also, as part of the project procedures and during the home visits, all patients and their family members received necessary information from community facilitators on how to correctly use COPD medications, the necessity of using their medications as prescribed by their physician, when to call their doctor or emergency services for their COPD symptoms and exacerbations, avoiding smoking, and maintaining daily exercise and walking habits as well as keeping a healthy diet. The study was conducted at a university-based research centre. It was approved by the University of British Columbia Office of Research Ethics. All subjects signed a written consent form in their native language that explained detailed information on the project, its aims, the patient’s involvement and requirements prior to the study. Consent forms were translated by community facilitators, and patients were asked to sign only if they fully understood and agreed to participate. A total of 15 bilingual-bicultural community facilitators were recruited and selected based on suggestions and recommendations received from members of the six minority ethnic groups. The facilitators participated in initial training to ensure their interactions with the patients were consistent, and that they recorded the response of the patients by writing down their verbatim words and explanations to avoid any data collection bias. During the training, facilitators and the research coordinator reviewed the focus group questions, how best to present these to each group, and ways of motivating participants to engage in discussion. They met periodically before each session to ensure that the data collection process was well organised. In addition to community facilitators, we also involved a professional video maker and a respiratory educator to help in the development of educational materials. To build rapport, ensure good communication, gain the patient’s trust and give value to the language in which they communicated, patients were interviewed in their native languages. To improve the possibility of capturing the best of their views and feedback about the materials, we also involved the family caregivers in the interview and material review process in all community groups. The community facilitators delivered the study questions orally and noted the patients’ and family members’ comments, questions and concerns on the answer sheet, as well as their responses to open-ended questions. The English-speaking project manager attended all interviews to reduce the likelihood of observational errors and took notes of the patients’ comments and demonstration of inhaler technique while the facilitators were conducting the interviews. During the interviews, the manager asked facilitators to clarify some questions or procedures with patients and family members. The facilitators asked patients the questions for clarification and translated their responses, which were then noted down by both the facilitators and manager. At the conclusion of each session, the notes were reviewed by the team, including the manager and facilitators, for clarity, precision, necessary adjustments and reflections. Our study began with exploration focus groups and in-person interview sessions that were conducted with patients fromthe targetcommunities, namely Chinese (Mandarin and Cantonese), Koreans, Filipinos and Iranians, in addition to English-speaking. Our intention was to assess patients’ attitudes, beliefs, practices and knowledge related to COPD self-management during patient-oriented focus groups and personal interviews in each of the target communities. We applied a convenience sampling method and recruited 46 individuals: 30 were COPD patients and 16 were family caregivers. Eligibility criteria were a physician diagnosis of COPD, at least 21 years of age, been an immigrant to Canada, belonged to the cultural communities targeted by the study, and resided in theGVA during the study period. Participants were asked to bring along their prescribed medications to the interview or focus groups to review inhaler techniques. 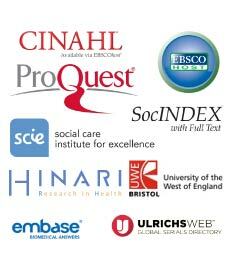 Participants were recruited with the help of collaborating organisations (e.g. professionals at VCH community organisations and British Columbia Lung Association), specialty and primary care doctors and respiratory therapists. Professional collaborators and care providers identified eligible patients according to the study criteria. If a patient showed interest in participating, he/she was asked to contact our centre to speak with a facilitator who communicated in their native language. In order to capture participants who might not have access to our collaborating specialty doctors and family physicians, we also advertised in local community newspapers and used radio broadcasting in the target communities. For data analysis we applied three steps in order to identify specific themes: (i) systematically reading transcripts, reviewing notes on non-verbal content (provided by the facilitators), and comparing and contrasting responses of participants within and across groups to document emerging themes; (ii) establishing categories and coding themes; (iii) sorting responses into thematic categories. The results of this qualitative research revealed that participating patients showed interest in learning how to find relevant and useful information and services about their chronic disease in their community language. In general, disease-related knowledge and awareness about COPD symptoms and how to manage them were low among patients in the target communities. 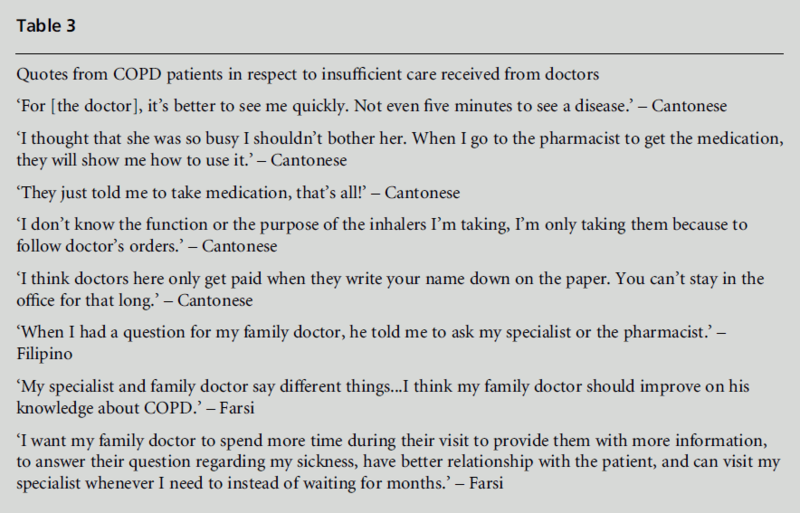 Language and cultural barriers, lack of understanding care provider instruction on selfmanagement, and concern about side effects of medications were identified by almost all patients as major problems when trying to communicate with care providers about managing their COPD. Tables 1 to 4 summarise the content of qualitative data and quotes reported by the patients about their knowledge, beliefs, perceptions, attitudes, concerns and practices related to COPD management. Furthermore, in common with English-speaking COPD patients in Canada, patients in this study had universal challenges and concerns regarding COPD medications, treatment and access to proper services, which are summarised in Table 5. These findings reveal and support the importance of developing culturally and linguistically appropriate COPD educational materials. In contrast, Cantonese COPD patients were more knowledgeable in terms of their disease and selfmanagement practices. For example, patients knew that exercise was important, to eat in moderation, and to take medications accordingly. Moreover, two Cantonese male patients had attended a COPD pulmonary rehabilitation programme previously and used the materials received to manage their COPD. ‘I was taught which to inhale first [inhaler] in rehab. I did not know before, and after going to rehab, I started knowing. After a year, my flare-up [exacerbation] symptoms started to diminish.’ Very few patients from the targeted communities had received verbal or written information on what to do in a case of emergency. Other types of traditional self-management practices mentioned by participants in all language groups included tai chi to help with lungs and breathing, salt water to clear up phlegm in the morning, wearing a scarf to keep warm and quitting smoking. Table 1 includes more comments made by participants regarding current knowledge and COPD practices. Filipino patients also felt that the pharmacist had more time to explain inhaler use than family doctors. One female Filipino patient used the British Columbia Nurses hotline (a telephone line providing health information staffed by nurses in British Columbia) to obtain information for her COPD. A male Farsispeaking patient identified that he would like to receive information through a nurse hotline available in his native language and communicate with a care provider over the phone. Table 2 contains more narratives by participants in relation to other trusted sources of health information. The participating patients also stated that they normally tried to find other sources of health information for their needs to fill this knowledge gap. In the Farsi community, a majority of patients informed us that family doctors in Canada are not as caring compared to doctors in their home-country. Subjects reported that doctors in Canada were said not to provide enough time and resources for the needs of the patient. A male Mandarin patient said: ‘My family doctor is very busy and I do not feel confident enough to ask him for any health information because he never has time to explain.’ Many also stated that it is harder to see a specialist through the healthcare referral system due to long waiting times. Hence they preferred to go back to Iran to consult with a healthcare professional. Korean COPD patients, likewise, found that doctors in Canada need to be prompted with questions or direct requests to obtain necessary services and information. Along the same lines, a Farsispeaking male patient indicated: ‘It would be better if GPs spent more time with COPDpatients giving them more information, should talk to patient directly even if old [sic]’. Additional quotes mentioned by participants regarding communication issues with their official care providers can be found in Table 3. Obtaining correct information on the side effects of COPD medications was also important for Chinese patients. Patients were aware that this information was provided in the instruction leaflet that comes along with the medications but thought that a healthcare provider such as a pharmacist or doctor should explain the side effects verbally to the patient upon use. One Cantonese patient said: ‘I think side effects should be mentioned because the manufacturer has included this in their instructions. I think side effects should be mentioned because most people would not read the information provided by the manufacturer.’ More information is summarised in Table 4. As stated above, patients in the focus groups and individual interviews showed interest in learning more about their disease and how to manage it. Yet many barriers to obtaining health information were cited by our participants. Language was stated as a main barrier to successfully accessing and receiving information and services for COPD. A Cantonesespeaking patient said: ‘I can’t speak English and my son went with me. The problem is that I can’t speak English.’ Likewise, Farsi-speaking patients also complained about the lack of available translators and interpreters in the healthcare system when visiting a doctor or the hospital. Most research to improve self-management among ethno-cultural communities has been limited to enhancing disease-related knowledge (Johnson et al, 2004; Caidi, 2008; Harris et al, 2008). Improving knowledge is necessary, but is insufficient alone to empower patients to gain the necessary skills to properly manage COPD (Coulter et al, 2006). Education alone will not necessarily lead to behavioural modification, and previous research has shown substantial improvements in disease management among mainstream patients while improving self-confidence and applying behaviour modification strategies (Worth and Dhein, 2004; Harris et al, 2008; Labrecque et al, 2011; Almagro and Castro, 2013). Patients need to learn how to integrate self-management skills into their daily treatment routine. Lifestyle, culture and language are important factors in self-management, particularly when these differ from the majority. In ethno-cultural communities, a patient’s ability to comprehend their physician’s instructions and the potential for improved adherence to their treatment regimens is shaped by cultural factors and the support he/she receives from the family members that extends beyond education level, language proficiency or socioeconomic status (Johnson et al, 2004; Monninkhof et al, 2004). The challenge of limited ability to recall information in elderly subjects (due to possible cognitive impairment) is amplified when patients with limited English proficiency may have more difficulty comprehending medical information and treatments prescribed by a care provider who communicates in English (Bourbeau et al, 2004; Coulter et al, 2006; Karliner et al, 2007; Johnson et al, 2011). Such individuals are consequently more likely to be nonadherent due to misunderstanding instructions given by physicians and other healthcare providers (Karliner et al, 2007; Press et al, 2011). This factor may be associated with greater mortality and morbidity than their mainstream counterparts (Dransfield and Bailey, 2006; Khan et al, 2008; Shaya et al, 2009). Considering the limitations of educating COPD patients from ethnic minority groups identified by other studies, we applied a community-based approach that involved patients, their family members, professionals and keycommunity stakeholders in all stages of our project. We used a communication approach trusted most by the target ethno-cultural communities, namely using COPD-related information materials developed and presented by individuals who communicated in their native language. We created a trustful environment and encouraged patients and their family members to not only help us further develop our materials, by providing their feedback about the materials, but also to talk about their own concerns, challenges and barriers that they may encounter while accessing and using health information and care services to manage their chronic disease. We received promising support from the patients and their family members related to the development of educational materials. Previous research has attempted to enhance patients’ access to relevant and appropriate education materials about COPD and how to manage symptoms and exacerbations, applied different interventions such as using peer educational programmes, psychosocial support group strengthening, conduct home monitoring, address barriers and facilitators of self-management (e.g. disease-related skills), and improve self-efficacy (Bourbeau et al, 2004; Worth and Dhein, 2004; Almagro and Castro, 2013). While such interventions showed modest improvements in disease management among mainstream patients, their efficacy among COPD patients from ethno-cultural communities has not been systematically studied. More important is the presence of self-efficacy among patients to perform the recommended treatment regimen. Proper communication with patients from ethnocultural communities, in particular older adults, and improving their access to culturally and linguistically relevant health information materials are, therefore, key to successful disease management and health outcomes (Anderson et al, 2003; Flores, 2005; Poureslami et al, 2007). Patients in this study stated that they utilised health services in recent years but had never fully received information about COPD: its symptoms, triggers, medication and self-management practices including how to manage a lung attack (exacerbation) in their native language. Information was usually presented verbally and no patients from our study had ever been provided with a written action plan for COPD. Most of them did not even know what an action plan was, had never heard of it and had no idea how to use it. There were various misinterpretations and doubts on how to properly manage their COPD. Family physicians were the first source of health information but were lacking in assistance: while family doctors were identified as the most trusted source to receive disease-related information, they were also identified as a major barrier to understanding the nature of illness and what steps they could take to manage it, mainly due to lack of proper communication between patients and their care providers. Patients felt that their family physician did not have sufficient knowledge on their specific disease. Those who conveyed this concern went on to find other relevant sources of help such as websites, family members, other healthcare professionals or their pharmacist. Patients from the different communities reported that sometimes they came across questions and queries they would like to discuss with their doctor but often forgot by the time they were able to meet a physician. It was recommended to include a ‘notes’ section on the side so that patients could write down the information they would like to discuss during appointments. We applied the quotes shared by patients and their family caregivers (some of which aresummarised in Tables 1 to 5) in the development of information written materials and video clips in the target languages. This provided necessary information to COPD patients about how to correctly use their inhaler medications, how to control COPD exacerbations, how to avoid smoking and other tips to selfmanage their disease. We noticed that many patients did not use their COPD inhalers correctly, or follow their doctor’s instructions properly, mainly among older participants who indicated having difficulty understanding their physician’s treatment regimen. Many participants indicated that when they obtained relevant educational information – provided by trusted people (community members and physicians who speak the same language) or when family caregivers accompanied them to visit the doctor – they were more likely to follow the instructions received from their doctor and aimed to better manage their chronic illness. This indicates that when patients receive information that is culturally and linguistically relevant, their understanding of self-management concepts and physician instructions improve. We believe that patients can be perceived as ‘experts’ in their own disease management if they are empowered by practical skills to manage their illness. Therefore we fully involved patients in the study as collaborators to produce educational materials, because they were the end-users and consumers of healthcare information and services. This ensured that the information created was applicable to patients and met the real needs of ethno-cultural communities. This approach also facilitates patients’ collaboration in the project and willingness to follow the recommended procedures with confidence, and promotes patients getting actively involved in the learning process on how to selfmanage their chronic disease. Due to possible cognitive decline and some activity limitations of COPD patients in our study (as reported by the patients or their family members), we observed active and useful involvement of family members (mainly the spouse) in COPD management: taking daily medication, treatment dosage modification, diet intake, exercise and other physical activities. In some cases, and among male participants fromthe Farsi and Korean communities in particular, we observed that the patient’s wife or adult children decided on or recommended a reduction in COPD medication use (dosage modification), limit of physical activities and certain diet intake for the patient. This finding may suggest that in these newcomer communities the concept of health and wellbeing may not be an individualised issue and it seems the decision to manage chronic disease is made by collective agreement between patient, immediate (informal) caregiver at home and other family members. Other studies have identified family members as the best supporters and primary caregivers in chronic illness (Kanervisto et al, 2007). Educational programmes for COPD management for ethno-cultural communities need to involve family members in addition to the patient in the learning process. Further investigation with larger sample sizes could also explore the role of spouses or other family caregivers in medically related skill-based learning for COPD patients in different ethno-cultural groups. Studies in Canada and elsewhere have attempted to increase patient awareness and action to manage COPD exacerbations; applying educational programs to help patients to identify and manage triggers, home visits, identify barriers to self-management, and improve self-efficacy (van Eeden and Burns, 2008; Hernandez et al, 2009; Simpson and Jones, 2013). We applied all these approaches in our community-based participatory research and generated remarkable knowledge in terms of patients’ self-efficacy and self-management practices, which could be applied in developing culturally and linguistically appropriate COPD educational materials. The learning approach we employed in our study not only facilitated the patients’ active participation in the education development process but also helped them to better understand their disease and its management. This finding suggests that the interaction of language, cultural beliefs and practices, access to relevant educational materials, and involvement of family members in the learning process may influence a COPD patient’s ability to accurately manage his/her chronic condition at home. COPD in minority communities is managed within the family context. These patients may feel misunderstood and diminished by their care provider or the health system due to language and cultural barriers that occur when trying to obtain health information. Our findings add to the literature suggesting that succinct, culturally and linguistically appropriate educational interventions that involve family members in the learning process can be used as a practical approach to effectively improve patients’ ability to manage their COPD. Health educators and professionals involved in COPD patient care need to address ethno-cultural issues in their interventions and practices. In addition, health promotion researchers need to tailor the information materials so that patients are able to develop and strengthen their sense of self-efficacy to manage their chronic disease. Investment in development of patient educational approaches, like our method, can be inexpensively used by a large number of inadequately educated patients from ethno-cultural communities who have COPD and need to learn self-management skills, and will extend opportunities beyond current patient education methods. We wish to thank the community members, facilitators, immigrant serving agencies, professionals, and key-informants from Chinese-, Iranian-, Filipino-, Korean-, and English-speaking communities in the Greater Vancouver Area who were involved in all stages of the project. This project was funded by the Vancouver Coastal Health Authority, Integrated Primary and Community Care (VCH IPCC), and partly by the Centre for Lung Health at the University of British Columbia and the British Columbia Lung Association. Almagro P, Castro A (2013) Helping COPD patients change health behavior in order to improve their quality of life. International Journal of Chronic Obstructive Pulmonary Disease 8:335Ã¢ÂÂ45. Anderson LM, Scrimshaw SC, Fullilove MT, Fielding JE, Normand J and the Task Force on Community Preventive Services (2003) Culturally competent healthcare systems: A systematic review. American Journal of Preventive Medicine 24(supplement 3):68Ã¢ÂÂ79. Bourbeau J, Nault D, Dang-Tan T (2004) Self-management and behaviour modification in COPD. Patient Education and Counseling 52(3):271Ã¢ÂÂ7. Buist AS, Vollmer WM, McBurnie MA (2008) Worldwide burden of COPD in high- and low-income countries. International Journal Tuberculosis Lung Disease, 12(7): 703Ã¢ÂÂ8. Chapman KR, Bourbeau J, Rance L (2003) The burden of COPD in Canada: Results from the confronting COPD survey. Respiratory Medicine 97(supplement C):S23Ã¢ÂÂS31. Bailey WC (2006) COPD: Racial disparities in susceptibility, treatment, and outcomes. Clinics in Chest Medicine 27:463Ã¢ÂÂ71. Ernst PP, Bourbeau J, Rainville B, Benayoun S and Suissa S (2000) Underestimation of COPD as a cause of death. European Respiratory Journal 16:(supplement 31):13s. FitzGerald JM, Haddon JM, Bradley-Kennedy C, Kuramoto L, Ford GT and The RUSIC Study Group (2007) Resource use study in COPD (RUSIC): A prospective study to quantify the effects of COPD exacerbations on healthcare resource use among COPD patients. Canadian Respiratory Journal 14(3):145Ã¢ÂÂ52. Flores G (2005) The impact of medical interpreter services on the quality of healthcare: A systematic review. Medical Care Research and Review 62:255Ã¢ÂÂ99. George J, Kong DC, Stewart K (2007) Adherence to disease management programs in patients with COPD. International Journal of Chronic Obstructive Pulmonary Disease 2(3):253Ã¢ÂÂ62. Harris M, Smith BJ, Veale A (2008) Patient education programs Ã¢ÂÂ can they improve outcomes in COPD? International Journal of Chronic Obstructive Pulmonary Disease 3(1):109Ã¢ÂÂ12. Hernandez P, Balter M, Bourbeau J, Hodder R (2009) Living with chronic obstructive pulmonary disease: A survey of patientsÃ¢ÂÂ knowledge and attitudes. Respiratory Medicine, 103(7):1004Ã¢ÂÂ12. Holm KE, Bowler RP, Make BJ, Wamboldt FS (2009) Family relationship quality is associated with psychological distress, dyspnea, and quality of life in COPD. COPD 6(5):359Ã¢ÂÂ68. Horowitz CR, Robinson M, Seifer S (2009) Communitybased participatory research from the margin to the mainstream: Are researchers prepared? Circulation 119: 2633Ã¢ÂÂ42. Shum J, Poureslami I, Cheng N, et al Kanervisto M, Paavilainen E, HeikkilaÃÂ¨ J (2007) Family dynamics in families of severe COPD patients. Journal of Clinical Nursing 16(8):1498Ã¢ÂÂ505. Karliner LS, Jacobs EA, Chen AH, Mutha S (2007) Do professional interpreters improve clinical care for patients with limited English proficiency? A systematic review of the literature. Health Services Research 42(2):727Ã¢ÂÂ54. Khan NA, Palepu A, Norena M, Ayas N, Wong H, Chittock D, Dodek PM (2008) Differences in hospital mortality among critically ill patients of Asian, Native Indian and European descent. Chest 134(6):1217Ã¢ÂÂ22. Kim V, Criner GJ (2013) Chronic bronchitis and chronic obstructive pulmonary disease. American Journal of Critical Care Medicine 187(3):228Ã¢ÂÂ37. Krishnaswamy A (2004) Participatory research: Strategies and tools. Practitioner: Newsletter of the National Network of Forest Practitioners 22:17Ã¢ÂÂ22. Labrecque M, Rabhi K, Laurin C, Favreau H, Moullec G, Lavoie K, Julien M (2011) Can a self-management education program for patients with chronic obstructive pulmonary disease improve quality of life? Canadian Respiratory Journal 18(5):e77Ã¢ÂÂ81. CA Lozano R, Naghavi M, Foreman K, Lim S, Shibuya K, Aboyans V, Murray CJL (2012) Global and regional mortality from 235 causes of death for 20 age groups in 1990 and 2010: A systematic analysis for the Global Burden of Disease Study 2010. The Lancet 380(9859): 2095Ã¢ÂÂ128. Monninkhof EM, van der Valk P, van der Palen J, van Herwaarden C, Partridge M, Zielhuis, G (2003) Selfmanagement education for chronic obstructive pulmonary disease: A systematic review. Thorax 58(5):394Ã¢ÂÂ8. Monninkhof E, van der Aa M, van der Valk P, van der Palen J, Zielhius G, Koning K, Pieterse M (2004) A qualitative evaluation of a comprehensive self-management programme for COPD patients: Effectiveness from the patientsÃ¢ÂÂ perspective. Patient Education and Counseling 55(2):177Ã¢ÂÂ184. Murphy D, Balka E, Poureslami I, Leung D, Cruz T, Nicol A (2007) Communicating health information: The community engagement model for video production. Canadian Journal of Communication 32(3):34Ã¢ÂÂ47. Poureslami I, Rootman I, Doyle-Water MMR et al (2011) Health literacy, language, and ethnicity-related factors in newcomer asthma patients to Canada:Aqualitative study. Journal of Immigrant and Minority Health 13(2):315Ã¢ÂÂ22. Poureslami I, Nimmon L, Doyle-Waters M, FitzGerald JM (2012) Using community-based participatory research (CBPR) with ethno-cultural groups as a tool to develop culturally and linguistically appropriate asthma educational materials. Journal of Diversity in Health and Care 8(4):203Ã¢ÂÂ15. Poureslami I, Nimmon L, Doyle-Waters M, Shum J, FitzGerald JM (2014) Hearing community voice: Methodological issues in developing asthma selfmanagement educational materials for immigrant communities. Ethnicity: Theories, International Perspectives and Challenges (pp59Ã¢ÂÂ84). Charles Agyemang, Collins O. Airhihenbuwa and Ama de-Graft Aikins, New York: Nova Science Publishers, Inc. Poureslami IM, Rootman I, Balka E, Devarakonda R, Hatch J, FitzGerald JM (2007). A systematic review of asthma and health literacy: A cultural-ethnic perspective in Canada. Medscape General Medicine 9(3):40Ã¢ÂÂ8. Press VG, Arora VM, Shah LM, Lewis SL, Ivy K, Charbeneau J and Krishnan JA (2011) Misuse of respiratory inhalers in hospitalised patients with asthma or COPD. Journal of General Internal Medicine 26(6):635Ã¢ÂÂ42. Restrepo RD, Alvarez MT, Wittnebel LD, Sorenson H, Wettstein R, Vines DL and Wilkins RL (2008). Medication adherence issues in patients treated for COPD. International Journal of Chronic Obstructive Pulmonary Disease 3(3):371Ã¢ÂÂ84. Scott AC, Baltzan MA, Dajczman E, Wolkove N (2010) Patient knowledge and information needs in chronic obstructive pulmonary disease: Back to basics. CHEST 138(4):476Ã¢ÂÂ89. Shaya FT, Maneval MS, Gbarayor CM, Sohn K, DalalAA,Du D, Scharf SM (2009). Burden of COPD, asthma, and concomitant asthma among adults: Racial disparities in a Medicaid population. CHEST 136:405Ã¢ÂÂ11. Simpson E, Jones MC (2013) An exploration of self-efficacy and self-management in COPD patients. British Journal of Nursing 22(19):1105Ã¢ÂÂ9. vanEeden SF, Burns J (2008) A multidisciplinary approach to the treatment and management of chronic obstructive pulmonary disease. BC Medical Journal 50(3): 143Ã¢ÂÂ7. Worth H, Dhein Y (2004) Does patient education modify behaviour in the management of COPD? Patient Education and Counseling 52(3):267Ã¢ÂÂ70.